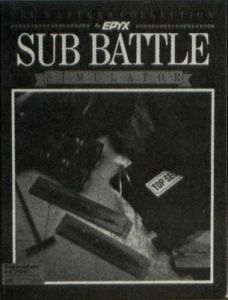 Sub Battle Simulator is the third submarine simulator published for the ST in the past year (Silent Service from MicroProse and GATO from Spectrum Holobyte are the others), and it compares favorably to its peers. Like the competition, Sub Battle Simulator casts the user as a circa-World-War-II sub commander with a variety of tactical and strategic options (as well as a couple of high-tech aids undreamt of by submariners of four decades ago). The game features three modes: Target Practice (vs. an enemy convoy), Single Mission and Wartime Command (which covers the entire war). Sub Battle uses a Macintosh-style interface with File (loading, saving, new game, target practice), Information (target tally, ship's log and vanity board), Special (navigator, time compression, send SOS, radio position, transfer torpedo, abandon ship, send shore party and sound controls), and Mission (current orders) menu headers accessible throughout the game. The game screen is comprised of four gauges (view, heading, speed and depth) in a vertical strip occupying the left fourth of the screen; a visual display; dialog box (for crew responses, radio messages, etc. ); and twenty-one click-on command boxes (crash dive, run silent, diesel power, charge battery, deck gun, launch forward and aft torpedo, etc.) Smaller secondary screens can be brought up with a mouse click. These include views from the tower, periscope, binoculars, sonar screen, radar screen, map display (with zoom), side display and status readout. Sub Battle Simulator is a state-of-the-art product, with excellent sound and graphics and an accessible user interface. It most resembles GATO in its look and play style, but it is clearly superior to that slightly dated product. On the other hand, it can't match Silent Service for visceral punch and cinematic ambiance, but does make up for that with its precision and sense of realism. The excellent documentation not only details the user options and equipment, but provides a well-written historical perspective that enriches an already solid game.